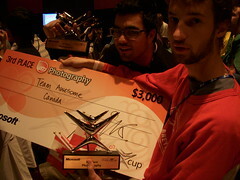 Imagine Cup 2007 Korea – Canada Wins! I can now announce that Team Awesome came 3rd place in the Photography Challenge and walked away with a giant cheque and trophies! Congratulations to both Team Awesome (Team Robot Hospital and the rest of the Canadian and U.S. teams) on winning the finals, flying to Seoul, South Korea and participating in this world competition! Now what's next? 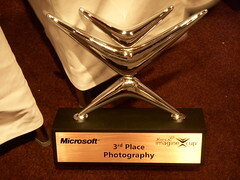 I've collected photos and videos from the event that I will be posting as post-Imagine Cup resources. Imagine Cup 2008 France has been announced and we at Microsoft will be working with faculty and students across Canada to encourage participation and get some great teams to Paris. The theme this year is the environment and there have been a number of changes that have been announced such as a Game Development challenge! If you are a student, a dean or professor and you are interested in being part of the Imagine Cup - contact us!